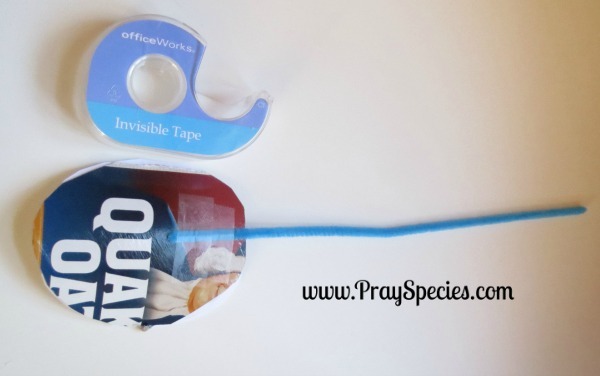 Pray Species is delighted to be joining in a blog hop created by My Mundane and Miraculous Life featuring hands on activities to compliment The Jesus Storybook Bible. 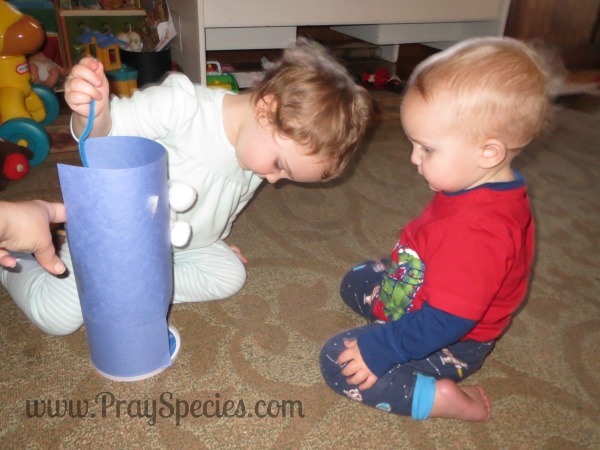 This simple activity is a huge favorite with our toddlers and very easy to complete with items found around your home. A FREE printable of Jesus, created by yours truly, is connected with this post for use with our craft. A FREE black and white version of the printable of Jesus is also available for those with littles who like to color. When Ladybug was an infant, we received The Jesus Storybook Bible by Sally Lloyd-Jones as a gift from a dear family member. That family member had used this storybook bible for years with her two sons and wanted to share her find with our family. We have thoroughly enjoyed sharing these stories and beautiful illustrations by Jago with our children. 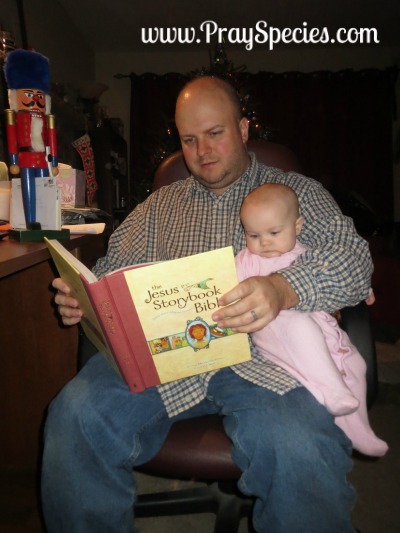 Below is our little Ladybug at her very first Christmas reading with her daddy from The Jesus Storybook Bible. 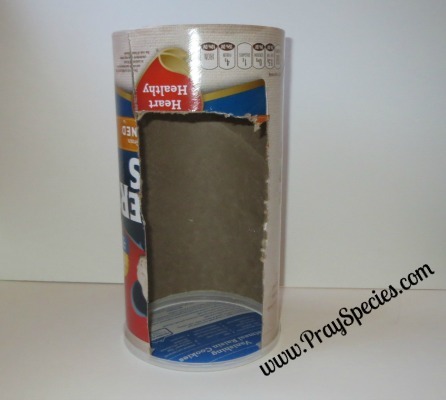 Using scissors, cut out a window in the oatmeal container (see below). Use the width of the Jesus printable (after he has been cut out) as a guide for how large to make the window. If the window is too large, you can easily use the construction paper to minimize your window. In our family, using scissors is still an adult supervised activity. Save the top to the container as well, it helps stabilize the finished craft. 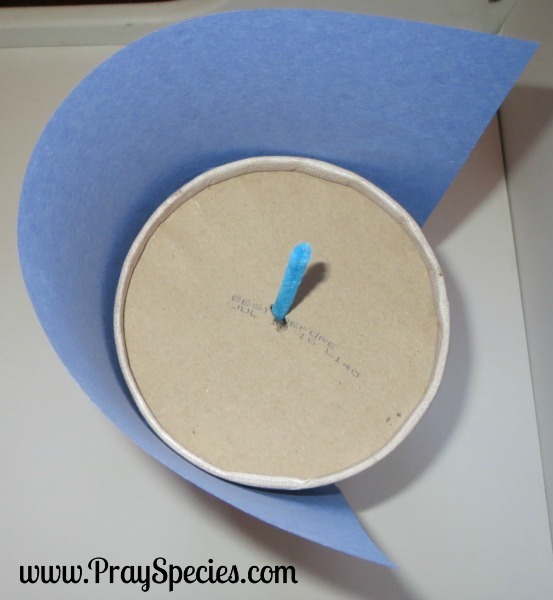 Glue your first piece of blue construction paper around the oatmeal container, leaving the window open. Glue is a kid friendly activity in our house. Adult supervision is typically required for allowing the glue to dry completely. This is especially true in this instance, since the oatmeal container is round. 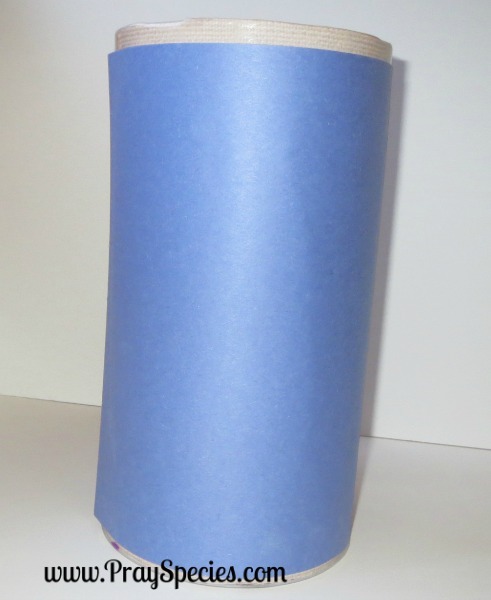 Glue the second piece of blue construction paper around the front of the container. Take this opportunity to shrink your “window” if your initial cut appears too large or too long. 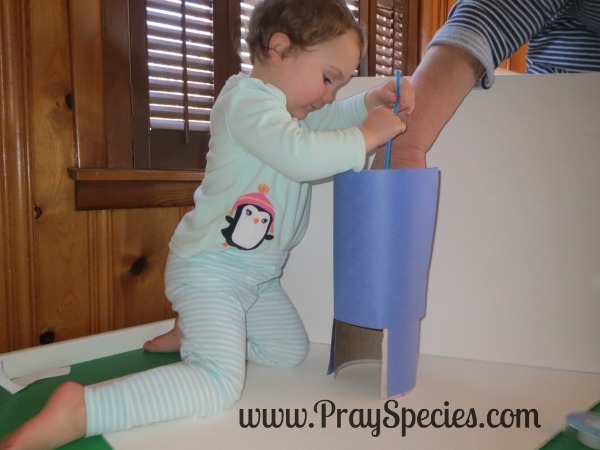 In the image below our little Ladybug is securing the construction paper onto the oatmeal container with stick glue. I highly recommend going behind the little hands with regular glue to make sure the paper sticks well. 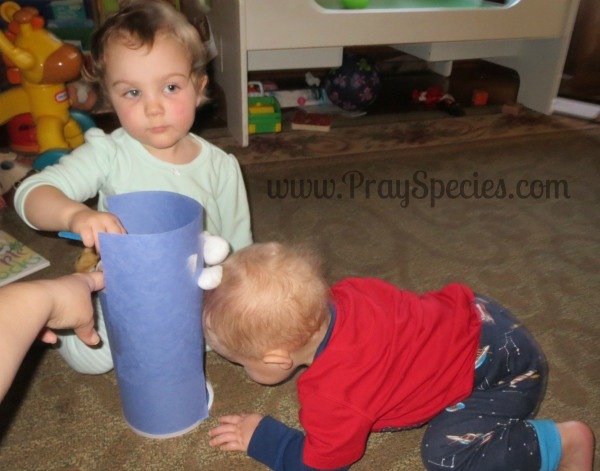 In the next image below, Ladybug is helping pick the spot in the middle of the “bottom” of the oatmeal container in which the pipe cleaner will pass. Using scissors, we cut a small whole in the center of the bottom of the container. Ladybug then threaded the pipe cleaner through the hole and make sure it was long enough to reach the bottom, a.k.a. “top”/”lid” of the oatmeal container. In this next image, you can see the pipe cleaner successfully threaded through a small hole in the center of the bottom of the oatmeal container. 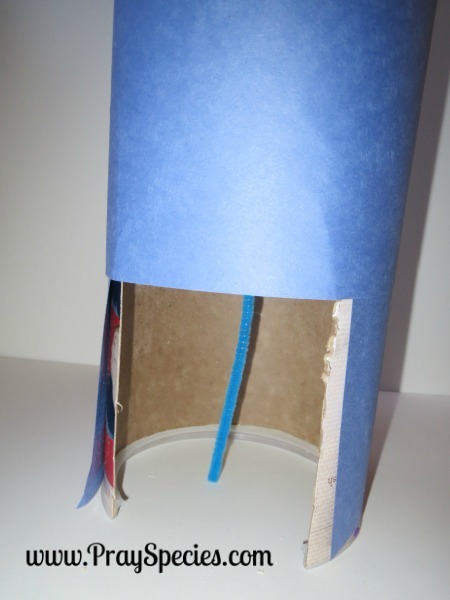 You can also see the construction paper beginning to separate from the tube. This was quickly and easily corrected with some regular glue and mild pressure. In this image we are testing to make sure the pipe cleaner reaches the entire length of the container. Jesus will be attached to the pipe cleaner at the ground level. Below is an image of my humble, but FREE printable of Jesus. We printed the image on regular paper. 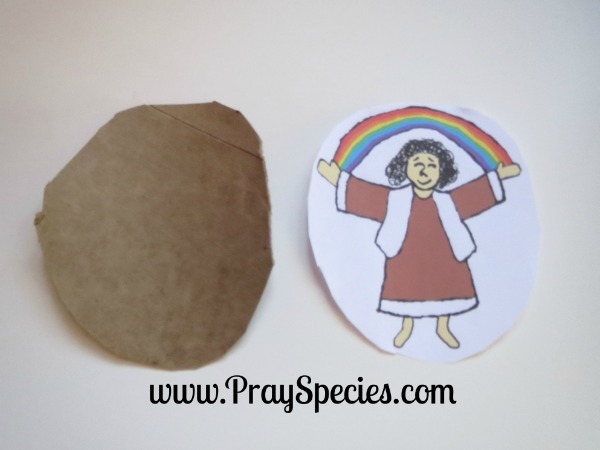 We cut out the printable of Jesus and then used it as a guide to cut out a similar sized piece in the remaining cardboard left over from cutting the window out of the oatmeal container. Ladybug then glued our image of Jesus to the cardboard. 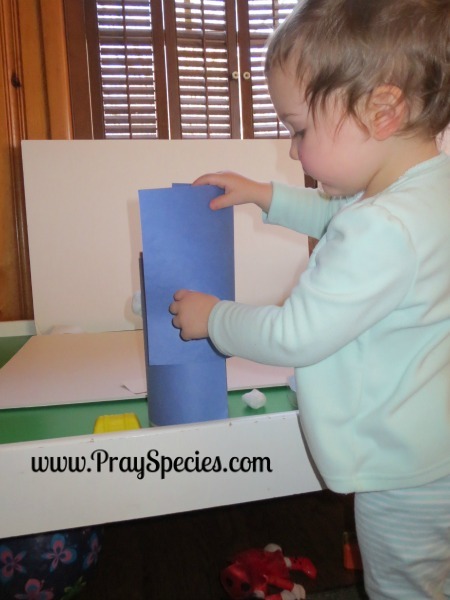 Alternatively, we could have printed Jesus on cardstock, but Ladybug loves using glue and this approach is cheaper. We used some generic tape to secure the pipe cleaner to the piece of cardboard; Jesus is glued to the front. The image below depicts this step. We threaded the top of the pipe cleaner in through the hole in the oatmeal container. 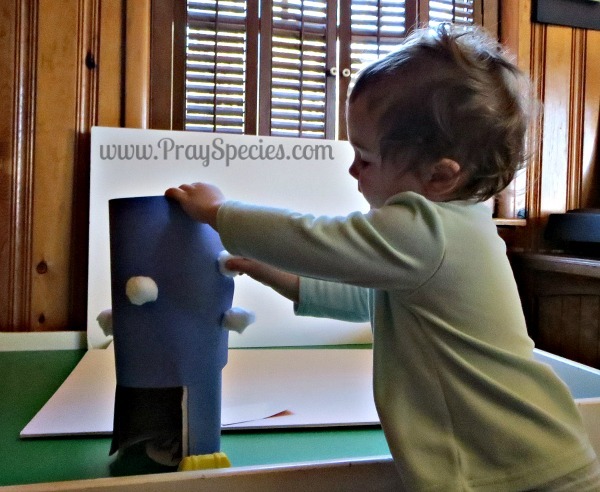 Ladybug tested the mechanism to make sure Jesus could ascend from the ground level up into “heaven,” where Jesus is covered by the construction paper. The image below shows our craft version of the ascension of Jesus into heaven. Ladybug loved that Jesus disappeared into the clouds of heaven. She loved watching him rise from the bottom to the top as she lifted up on the pipe cleaner. We did have to place a stabilizing hand on the container to keep it from toppling over. Leaving the lid attached did help stabilize the oatmeal container a little during the ascension. When Beetle Bug woke up from his nap, Ladybug was more than happy to show him her craft. In the image below, she is showing him Jesus. Then, she showed him how Jesus rose into the clouds. Notice, there is an adult hand holding the container in place, so it didn’t topple over during the demonstration. Beetle Bug crawled up into the container to try to find Jesus. He was especially excited when he later got a hold of the craft and found Jesus! 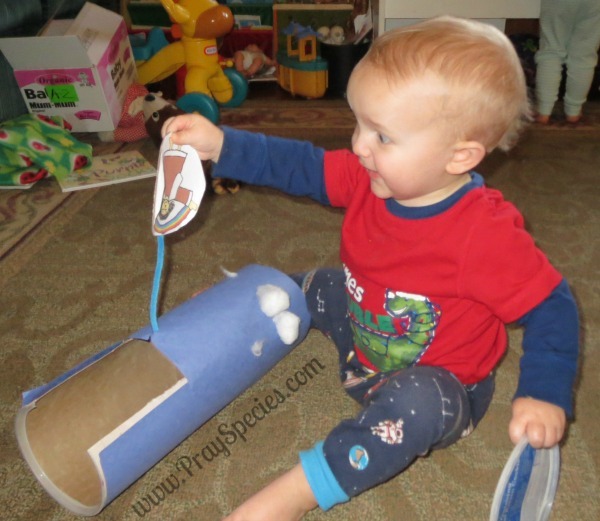 I love his excited face and how much both of my toddlers adored this craft. 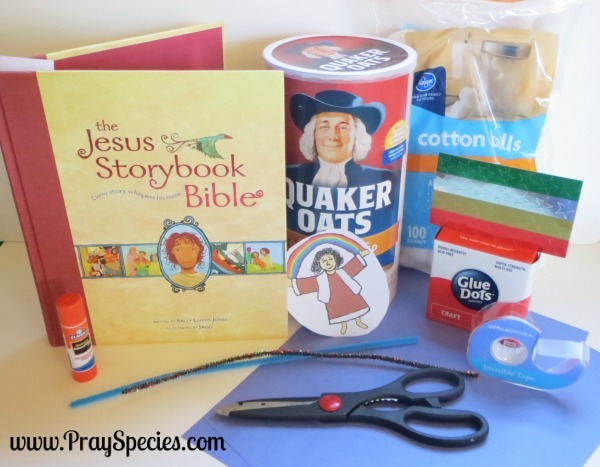 I sincerely hope you enjoyed reading about this simple, but fun toddler geared activity for “Going Home” from The Jesus Storybook Bible by Sally Lloyd-Jones. As a fun side note, the very next morning our little Ladybug found the spare oatmeal container that I had left on the table in case we needed a “do over” with this craft. As you know, this happens with toddlers 🙂 She opened the lid and peered inside, saying, “There is no Jesus in this one.” LOL She then said, “I’m going to make Jesus another home.” Love my precious toddler and encouraging her relationship with Jesus. Wishing you and your family great joy and many blessings! We are so thrilled to bring you a Jesus Storybook Bible Giveaway sponsored by Zonderkidz. 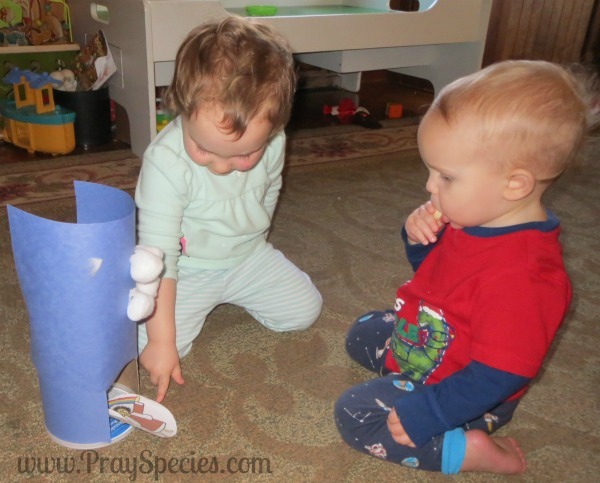 We love using the Jesus Storybook Bible in our home and know you will love it, too. 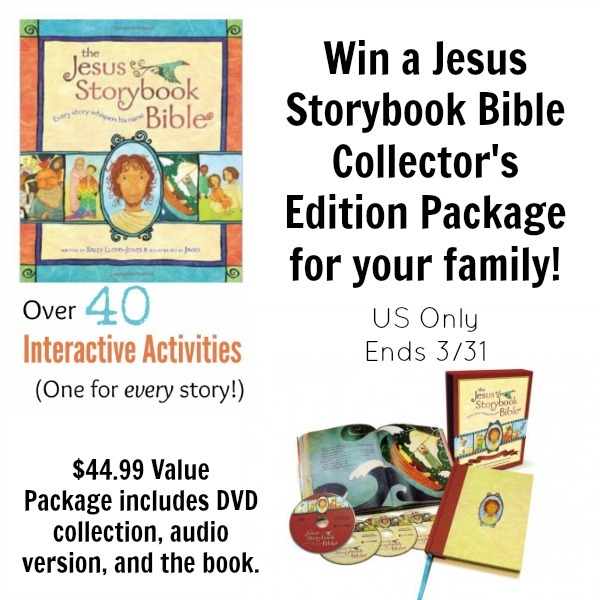 One winner will receive the Collector’s Edition of the Jesus Storybook Bible valued at $44.99, complete with a beautiful copy of the book, an audio version of the stories, and a DVD collection with animated versions of the stories. This collection would be the perfect Easter gift for any child. Be sure to follow The Jesus Storybook Bible Facebook Page for more information, and stay tuned for the rest of the Jesus Storybook Bible Hands On Activity Series. The giveaway is open to the US only and ends at 12:00 am CST on April 1, 2015. Please enter using the Rafflecopter form below. If you have trouble seeing the entry form on a mobile device switch to the classic version or click here to enter.